How Do Farmers Remove Stumps From Their Fields? Physically removing a tree stump requires more tools than most home gardeners have at their disposal. And hiring a tree removal service can be expensive. Many homeowners choose to dissolve tree stumps on their property with chemicals. But, despite the claims of many commercial products, this process does not happen overnight. 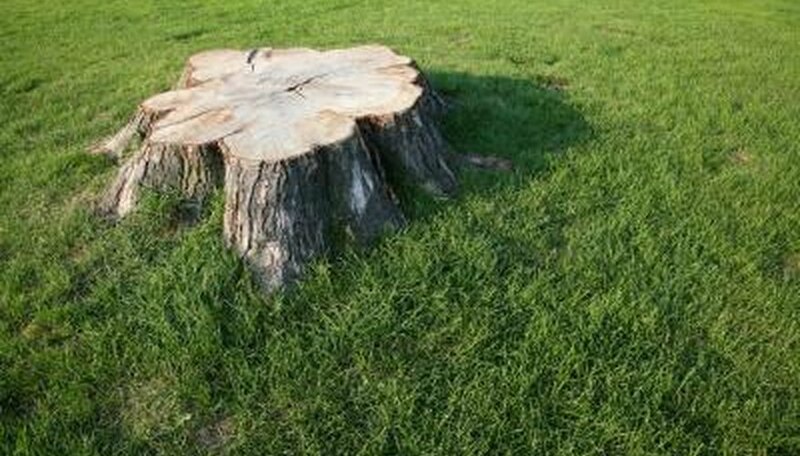 Any number of chemicals can be used to dissolve a tree stump, but they merely accelerate the decomposition process and it can take years to completely dissolve a tree stump. Use an axe or a chainsaw to cut the stump as close to ground level as possible. Drill several holes into the main stump that are at least 1 inch in diameter. The more holes in the stump and the deeper they go, the more quickly the tree stump will dissolve. Fill each of the holes with an accelerant. Rock salt,, commercial stump killers, high-nitrogen fertilizer, potassium nitrate (saltpeter), sulfuric acid, nitric acid, sugar and stump-killer are all acceptable accelerants that speed the decomposition process to varying degrees. Pour boiling water into the holes repeatedly until all of the chemical has dissolved and absorbed into the stump. Repeat steps three and four every six weeks until the stump is decomposed. Cut the tree stump as close to the ground as possible using your saw. Cover the cuts with sod and keep the sod moist. This will promote the rotting of the tree stump. Drill several holes into the top of the stump with a power drill, using a bit that will create a 1-inch diameter hole. This exposes the inner wood of the stump and promotes rotting. Add a small amount of fertilizer into the stump to provide organisms that will decay the stump the nitrogen they need to grow. Do this during the first year. Add sugar to the holes also to promote the growth of organisms that need carbon to multiply. Do this during the first year. Add topsoil to any small holes that appear in the yard due to the decay of the tree roots below ground. Dig a trench around the base of a stump two feet wide and two feet deep with a mattock hoe. Cut through any lateral roots with the hoe or a set of branch loppers. Push the stump over on its side to expose vertical roots such as the taproot. If the tree is too large to push over in one piece, divide the stump into pieces by chopping it up with an ax. Push each piece over individually. Cut the vertical roots beneath the tree with an ax or branch loppers. Pull the stump free of the soil. Dig a hole larger than the tree stump with the mattock and a shovel. Cut roots with an ax or branch loppers. Place the stump into the hole and cover it with soil. Cut the stump flush with the ground using the chain saw. Make a series of gouges in the exposed wood using the tip of your saw. This exposes more surfaces to rot. The more surfaces of the stump that are exposed, the faster the stump will rot. Cover the stump with sod. Wet the sod until it is soggy. 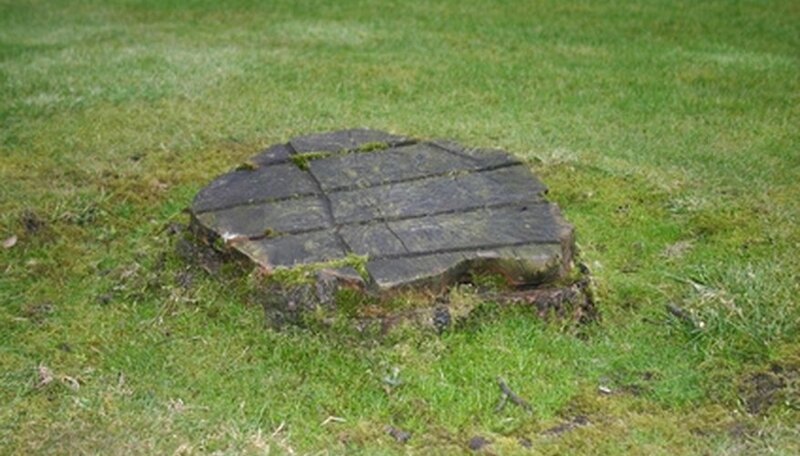 Keep the sod damp to encourage the growth of microbes and fungus that will rot the stump. Stump rotting may take up to five years. Dig a trench around the stump with a grubbing hoe. The trench should be 2 feet wide by 2 feet deep. Cut through thick roots using a chain saw. Tilt the stump onto its side to expose the tap root. Saw through the tap root with the chain saw. Lift the stump away from the roots. Fill in the hole left by the stump with dirt. Resist the impulse to cut the stump close to the ground. Use whatever height it has left as leverage to twist, pull or rock it to loosen side and tap roots. Dig a trench with a shovel, two feet from the trunk, all the way around the trunk. Make the trench at least 2 feet deep and 1 foot wide. Chop through side roots with a hatchet as you encounter them. Rock the stump back and forth once the trench is dug. Dig out more soil around the tap root with a spade. Cut tap roots that are 3 to 4 inches thick with a pair of long-handled pruning shears, reaching down into the hole as far as possible. Cut larger tap roots with an axe or hatchet. Drag the stump out of the hole once main roots are severed. Hack it into smaller pieces with the axe if necessary. Put the pieces in the wheelbarrow and cart them to your compost heap or elsewhere for disposal. Backfill the hole with soil and tamp it down firmly, adding more soil to keep the ground level. Cut the stump as close to the ground as possible. Rotting occurs more quickly if there is less wood to rot. Drill 1-inch diameter holes, spaced 1 inch apart, in staggered rows spaced 1 inch apart throughout the top of the stump. Each hole should be drilled straight down into the stump. These holes expose more of the surface of the wood to decay. Pour 1 cup of liquid fertilizer that is high in nitrogen (10-0-0) over the stump. Nitrogen helps feed the microbes that decay the stump and will hasten the decay. Do not add so much fertilizer that it burns the surrounding plants. Pour a cup of melted sugar over the stump after the second year. Fertilizer will no longer feed the microbes after the first year. Instead, sugar provides carbon to feed the organisms. Water the stump so that it is damp, but not saturated. Cover the stump with strips of sod to help keep it moist. The stump will quickly rot in this environment. Cut the tree down to a short stump level and remove all wood and debris from the area. Apply a generous amount of water to open the cambium layer which will carry the herbicide chemicals to the roots. The cambium layer is the layer next to the bark of the tree. Sever the roots of the tree with a saw or ax if there are other trees planted in close proximity. Tree roots will sometimes share the same vascular system which will cause the chemical treatment to spread and kill other trees. Apply a systematic herbicide to the stump immediately after cutting. Herbicides containing triclopyr or glyphosate are systematic and will travel through the vascular system of the plant. Wait several months to evaluate the process. Repeat the application of herbicide if necessary. Additional treatments of herbicide will increase the risk of damaging other vegetative growth around the stump. Most tree stumps will rot on their own if you are patient. The rotted stump can then be pulled out of the ground. Dig a trench around the stump you intend to remove using a spade shovel. The trench should be about eight to 10 inches from the perimeter of the stump. The purpose of the trench is to reveal the buried roots so they can be broken, allowing you to successfully remove the stump. Chop all of the visible roots using the chopping axe. The axe will need to be very sharp to cut through the roots easily. Insert the landscaping bar underneath the stump, after all of the roots have been broken away. Make your way around the stump prying upward on the stump to break any roots that were out of reach of the chopping axe. Remove the stump from its hole. Again, insert the landscaping bar underneath the stump. Pry upward while lifting. This will easily remove the stump from the ground. Use a hose or rope to mark a circle around the stump; the circumference of the circle should be 1 1/2 to 2 feet wider than the circumference of the bush that used to inhabit the space. Use a shovel to dig a trench around the line you've marked, then move the hose or rope out of the way. Dig from the outside edge of the circle in toward the stump, removing the soil to a wheelbarrow or making a pile of soil outside of the circle. How deep you dig will depend on the size of the stump to be removed; plan on 1 foot at a minimum and up to 3 or 4 feet for larger stumps. Use an axe or hatchet to chop through any thick roots that extend beyond the circle or go deeper into the ground than you are shoveling. Use the shovel as a lever to lift the stump from the roots up: push the shovel blade as far under the stump as you can, then push down on the handle to lift the stump up. You may find additional roots holding the stump down that need to be chopped off. Backfill the hole with the dirt you removed once you have the stump out; tamp down firmly to prevent the area from sinking, then cover with mulch or sod to keep the soil from eroding. Fix a 1/4-inch drill bit to an electric-powered hand drill. Steady the drill against the top of the stump and drill holes spaced 3 inches apart over the entire surface. Slip on a pair of rubber gloves and pour one part sodium hydroxide and two parts water into a clean bucket. Stir the sodium hydroxide and water to incorporate. Immediately pour over the top of the stump so it seeps into the drilled holes. Repeat this process every day for approximately 2 weeks, or until the stump is soft enough to easily chop up with a shovel and remove. Getting a tree stump up out of the ground on muscle power is hard work, and most farmers don't bother with it. The most thorough non-manual means of getting rid of a tree stump is to grind it. This begins by using a mattock and shovel to dig a shallow hole around the tree stump and also to remove any stones that might be lurking just under the dirt. With the hole dug around the stump, a chainsaw is brought out to trim the tree stump as far as possible, so as to minimize the work the grinder needs to do. Then the stump grinder is brought out, which reduces the stump to shavings. The shavings are then dug out and taken away, and fill dirt is used to occupy the empty space left behind. Some farmers don't want to rent an expensive grinder but also don't want to do the manual labor either. Accordingly, they may try to get away with burning the stump. The hole is dug around the stump as normal, but the next step is to fill it with dry brush. The area around the hole should be examined and cleared of anything that might catch fire. Then gasoline is poured onto the stump and dry brush. Usually some extra fuel, such as more brush, scrap lumber or trash, needs to be added to burn the stump away. Afterwards, the hole is filled up with dirt. Note that stump burning is illegal in most areas, as it is included in prohibitions against burning trash, leaves and other debris. The old-fashioned way of getting rid of a tree stump is to uproot it. This begins with digging the same hole, but this time wider and deeper. That is necessary because as many of the roots as possible will need to be cut, either with the mattock or with an ax. With many or most of the roots cut free, an iron tamping rod is wedged under the tree stump, and sheer weight, muscle power and leverage are used to uproot the stump. If enough of the roots have been cut away, or if enough men are working the iron rod, the stump should give way. Then the hole can be filled in as normal. Use the online American Rental Association directory to locate stores near you that rent out stump grinders. Enter your city or zip code in the "Find a Store" tab. Stores will not be categorized by rental type. Locate stores renting power tools and landscape equipment. Check with the Better Business Bureau to ensure the dealers are in good standing with no complaints on file. You can also contact home improvement centers such as Home Depot that rent tools. Ask about fees to deliver the stump grinder to your house, since the equipment is very heavy. Find out if goggles or ear protection is included. 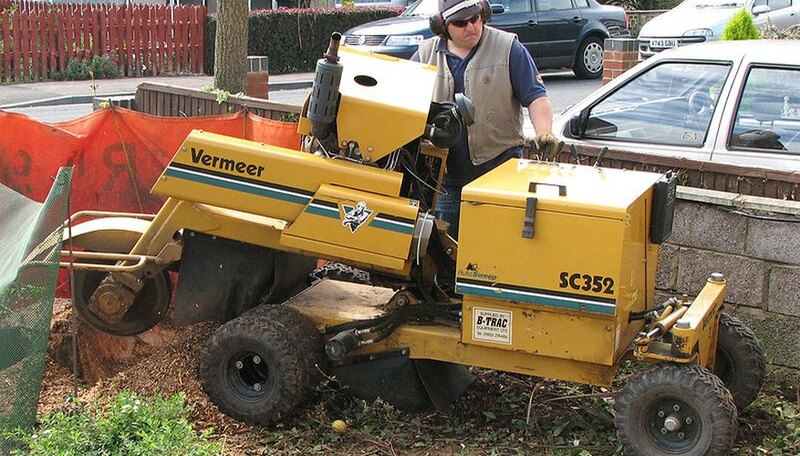 Choose the right type of stump grinder. Models include walk-behind, self-propelled and tracked grinders. Some are intended for rugged terrain; others for landscaped yards. A good rental agent will help you find a suitable model. Arrange the rental terms and pay the deposit. Make sure you know when the stump grinder will be dropped off and picked up, what maintenance and cleanup you will need to perform and any liability costs in case of damage.